Welcome to the Springfield Super Senior Prom of 1958. The Marvelous Wonderettes are the fill-in entertainment where their set list is all about love. 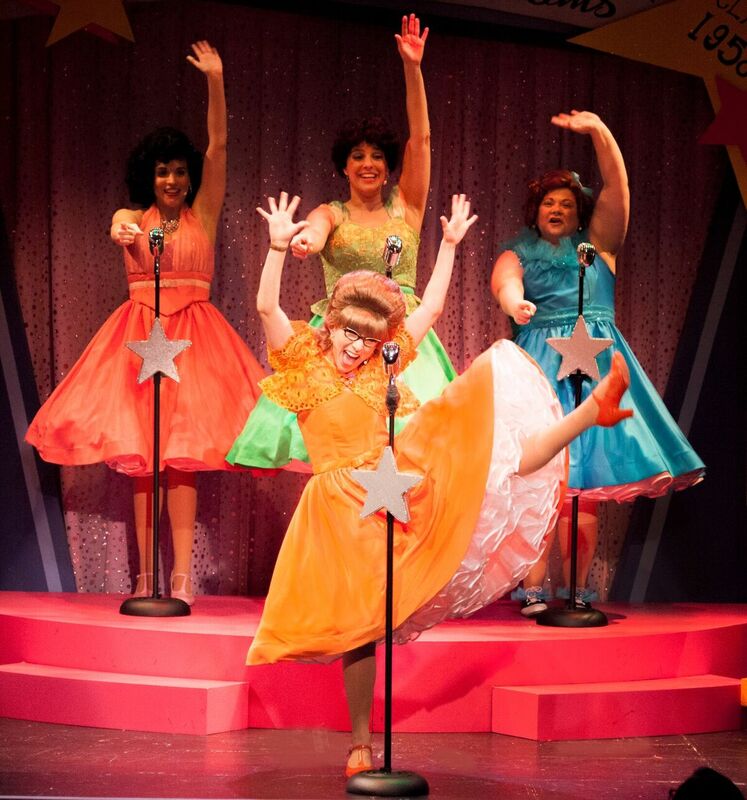 Receiving a sugary revival at Theatre Row, The Marvelous Wonderettes is a jukebox musical for the nostalgia deprived. With nearly two-dozen favorites from the fabulous fifties and songs from the swinging sixties, The Marvelous Wonderettes is marshmallow theater: light and fluffy with little substance. It doesn't matter that the plot is like sand paper, rough and thin, the draw to the show is the music. Thematically, Roger Bean's story unites four high school sweeties who sing songs about love that loosely reveal their character. By Act II, Bean reunites the girls for their ten year reunion as they, once again, perform for their peers while dealing with their personal woes. The Marvelous Wonderettes is colorful and bright that is truly a vocal showcase for music of the era. And that's really all that matters. To bring the production to life, directors Tom and Michael D’Angora and their creative took a simplistic approaching, doing only what was essential. The colorful cartoony set from William Davis worked well to capture the prom and reunion. The colors were consistent and bright. But the production element that was sadly damaging was the canned music that in turn forced a tinny sound, both in song and vocal. The cast was strong but you knew that their sound was not as natural as it should have been. The Marvelous Wonderettes is a song showcase for talented performers. By far, Sally Schwab was the scene stealing standout star of the show. Playing the goofy Betty Jean, Schwab had nothing but fun and games with a sensational voice to match. Playing color, costume, choreography coordinator Missy, Christina Bianco showcased her vocal prowess. Bianco explored a pingy character that was a robust leader with a meek side. Cindy Lou was beyond a perfect part for Jenna Leigh Green. It's as if Libby, Green's character from "Sabrina the Teenage Witch", had time traveled to the era. She was deliciously diva. At this particular performance, understudy Laura Woyasz took on the role of Suzy. She played Suzy a bit dim, balancing out the range of comedy. The Marvelous Wonderettes isn't groundbreaking theater. It's meant for fun and reminiscing. No matter your age, you'll have something to smile about. This isn't a show you go to for substance. You go for the nostalgic essence the music brings.